Are you considering adding of a new features to your house, or maybe you are looking to transform your living space into something more a bit more modern. Folding Sliding Doors – Architect’s No.1 choice and the perfect way for adding great value to your property. Bi-fold doors are definitely one of the latest trends in the home building and renovating market. It is a fact that more and more architects, builders, and contractors are using them, and this clearly shows that when it comes to new builds as well as in renovating, folding patio doors are the perfect solution. Bi-folding Doors have wide range of applications,with various choice of sills, threshold,[internal/external/divider or flush] which will allow you to install the doors almost anywhere, to have them in the kitchen, lounge, conservatory or when building an extension. Also, you can use them as a room divider giving you flexibility and choice within any space that you have. Sliding Folding Doors can also be used as a back door to your garden or patio, allowing you to have more than one point of entry to your house. What makes it possible is the highest quality, top hung hinge system, allowing effortless operation EVEN up to 12 panels that fold to one side. Because it is a top hung system whole weight is supported from the top and will require load bearing lintel in order to support weight of all door panels. Special hinge system is usually made of stainless steel and it is definitely one of the most important components of the whole door set. Hinges are tested up to 50.000 cycles to ensure smooth, fault free and continuous operation for years to come. In some cases cost of the hinge mechanism can be half of what you are paying for the whole thing, however at the end it is definitely worth it. Nowadays as standard all ironmongery components come with 10 year manufacturer’s warranty. So please remember to ask about the guarantee when choosing supplier. Does idea of an extra space that would transform your living space sounds interesting? Would you like to add great value to your home without need for any major refurbishment at affordable level? 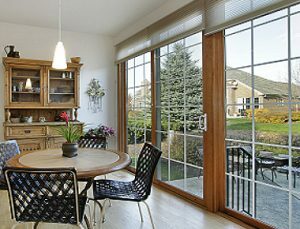 Sliding folding doors will certainly do that for you. Best saving can be made by looking for manufacturers offering range of bi-folds in standard sizes, as off the shelf items are only awaiting specification details for required colour finish. Some companies, when ordering from their standard size range can cut the delivery time even by half. This means that you will be able to enjoy the new addition to your home for years to come, safe in the knowledge that your folding sliding doors are guaranteed to last.